There’s a serial killer on the loose and all his victims look like you...from the author of USA Today bestseller, AFTER ANNA. A serial killer is stalking your home town. He has a type: all his victims look the same. And they all look like you. Kate returns from a post break-up holiday with her girlfriends to news of a serial killer in her home town – and his victims all look like her. It could, of course, be a simple coincidence. She becomes convinced she is being watched, followed even. Is she next? And could her mild-mannered ex-boyfriend really be a deranged murderer? 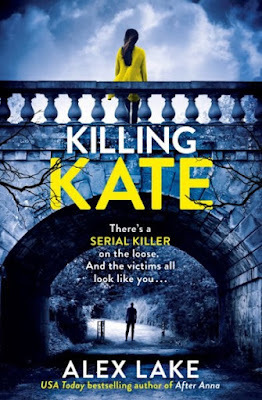 Killing Kate is an absorbing tale that will not leave your thoughts. Once you start reading, prepare to focus on nothing else until it's finished, and even then there's no guarantee that you will quickly move on. Alex Lake penned an intricate story that gives you more than a solved mystery. Kate Armstrong returns from vacation to find that there's been another murder in her town. The shocking part is that she knows some of the women and they even look like they could be her twins. At first it seems like coincidence. But when the body count increases Kate believes that someone is targeting her. Could it be the obsessed ex-boyfriend who can't let her go? Or a complete stranger who picked her out of a crowd? Alex Lake keeps you guessing right until the climax, but even then all is not revealed. There's more to this story than finding a serial killer which adds to the intricacy of Killing Kate's plot. It makes you wonder what you would do if in the place of Kate, or any of the supporting characters. Told in alternating perspectives, Kate and her ex Phil, the story takes you all around the board. From the past to the present the characters are bared to the reader so we understand them and the direction the story takes. The structure of the plot is unique. It's very sound and built to bring the story together seamlessly while also entertaining the reader. 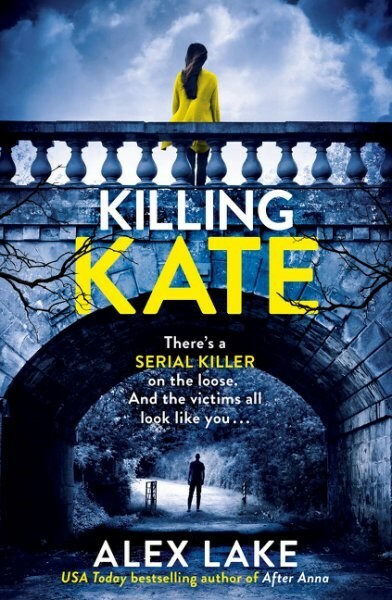 Killing Kate is a well-rounded story balanced by mystery, emotion and suspense. Right down to the last page readers will be wholly focused on the outcome. I admit to scratching my head a little because I wanted to figure it out before the end, but this is a story that cannot be rushed. Alex Lake is definitely an author to read!